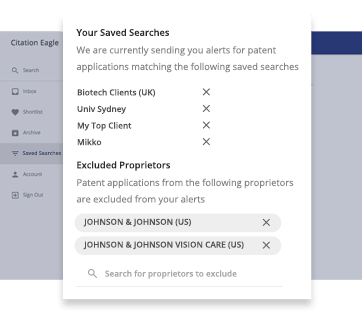 Easily discover and monitor customized opportunities from global patent citations. Search companies’ and law firms’ patent portfolios tapping into our live data feeds of more than 1.5 billion records. And identify and receive relevant and timely information concerning your own or your client’s IP interests. You decide what creates value for you. 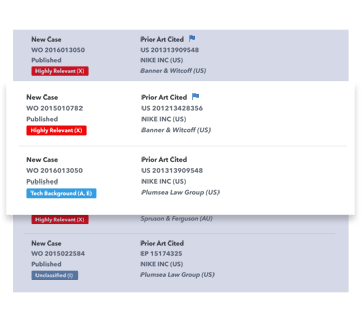 Search by proprietor or responsible law firm and refine your results with a choice of advanced filters. Effortless. We know which patents you own or look after, and their legal status. This eliminates the need for manual importing or regular updating of patents. Access 1.5 billion data points and create as many searches as you need. Even download the reports. Discover powerful patent insight that you can act on. Our search and alert system considers strength of opportunity and timelines for opposition or infringement procedures. Scanning 90+ IP Offices daily, Citation Eagle immediately alerts you to all opportunities or threats that match your criteria. This customised business intelligence is sent by email and also displayed in your Citation Eagle dashboard. There you can manage notification results. 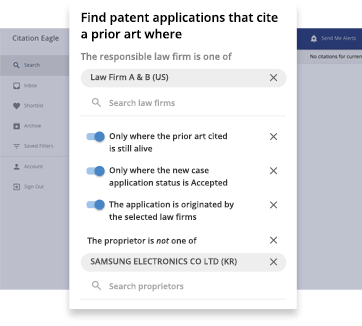 Citation Eagle is your automated patent advisory tool that helps you grow your business. Discover real licensing opportunities or likely threats of infringement, allowing for timely action and leverage. Monitor your patent portfolio automatically, effortlessly. Proactively manage references of your prior art and respond to business opportunities or infringements within key timeframes, and leverage.